Synthetic fabrics don’t work nearly as well as cotton, so pay attention to the labels. This entry was posted on 2017-10-28, 07:22 and is filed under Home Ec, Machine Shop. You can follow any responses to this entry through RSS 2.0. Both comments and pings are currently closed. Ed, your shop tips often remind me of Frank Ford’s tip pages, they just have a similar tone about them. If you have not seen these before, you’ll find them to be an absolute treasure trove, especially for the machine shop. I think his health has declined a few years back since there hasn’t been a word or an update for quite some time, he might have even passed away. He is/was quite talented and is really known a a luthier. I don’t do the musical instruments thing in any way but stumbled on to his page from a machinist’s forum. Early on, I fell under the influence of Guy Lautard’s The Machinist’s Bedside Reader series and it’s stayed with me ever since! Long out of print, alas. I also have the whole set, they ARE quite good and very practical. I just use scissors – cut the neck off and since I usually only get four rags per XL shirt not a lot of cutting and I also wait until the T Shirts are way past prime with holes and tears before retiring them to rags. Old socks also work well – I cut the toe out when they get past usage (when I take them off in the evening) – that is a cue to put them in the rag box after they are washed. Old socks also work nice to protect things like safety glasses and other things you don’t want scratched etc. 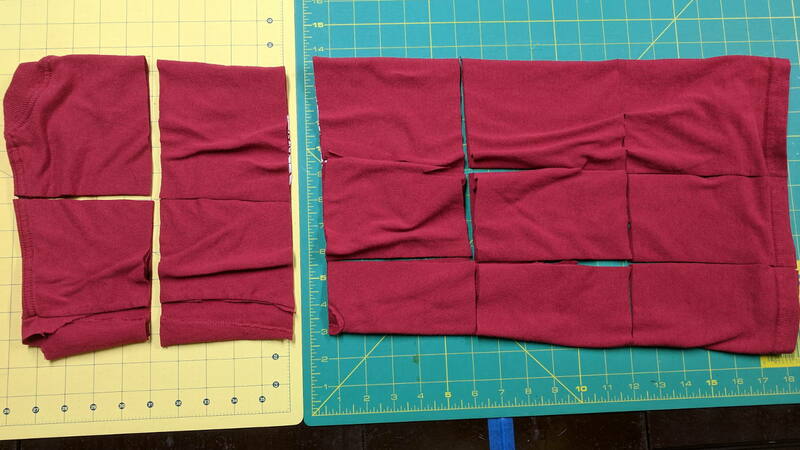 As soon as Mary started using rotary cutters for her quilting projects, I stopped using scissors for cloth: lay out a shirt, zip-zap-zot, and it’s done. Admittedly, I slice it into much smaller sections, but straight-line cuts go really fast. Gotta love those cutting mats, too. I’m told paper instantly ruins cloth-cutting blades, so there’s a fatwa concerning cutter use: should I even think of applying a new wheel to anything other than cloth, I will draw back a bloody stump. I should get my own set of cutters … or figure out how to resharpen the old blades. Instead of cutting mat, we use a large sheet of birch plywood. Ah, but your Lady isn’t using that blade for her quilting projects!